Does this webpage have any socially redeeming value? Well, that’s debatable. But if it does, it’s probably on this page, where I do my best to save you from the traumas I’ve experienced in the sordid world of the grocery store. Here I document and prove that the business of product packaging is a Machiavellian one indeed. Prepare to be shocked and horrified. Imagine that you’re heading back to school after a short visit home, and as you begin the five hour drive, you stop at your local Food Town grocery store to pick some crunchy munchy ‘keep me awake’ prezel rods. Only $1.39, what a great deal! And so easy to hold while driving. 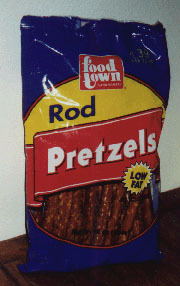 As you cruise along the Ohio turnpike, you get that hankering for a pretzel rod. Keeping both eyes on the road, you open the bag and reach inside to wrap your fingers around one. 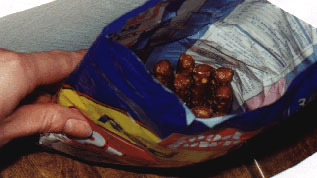 You’re baffled and dismayed to find that you have to reach deep inside the bag to find a pretzel. How could you have broken ALL of them between the grocery store shelf and your battered but beloved Dodge Daytona? Sneaking a peak inside the bag, you see that all the ends are intact… what’s going ON here? I’ll tell you what’s going on. 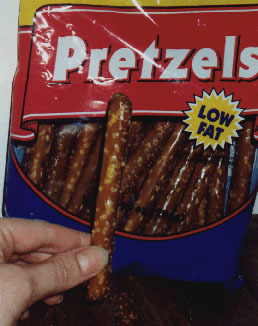 Food Town actually made these pretzel ‘rods’ just tall enough to reach past the clear window part of their packaging, thereby giving the ILLUSION of respectable pretzel rods. The rest of the bag was filled with cheaper, but less satisfying, air. Unconscionable. Everyone deserves a sweet indulgence once in a while, right? 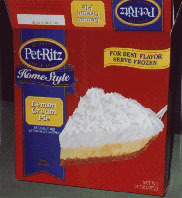 As a lover of all things lemony, this Pet Ritz Home Style Lemon Cream Pie was particularly mouthwatering, so I picked it up from my grocer’s freezer, noting with approval the ‘Quality since 1921’ seal by the brand name. Imagine my surprise when I opened the flimsy cardboard box to find that there was no type of inner wrapping. 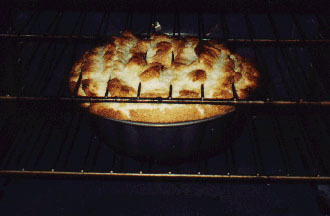 Just a pie. In a box. And the pie did not fare too well, as you can see. Carefully comparing my pie with the fluffy, creamy, attractive piece of pie pictured on the box, I came to the conclusion that their ‘Quality since 1921’ claim did not include their packaging department. My pie was really in pretty sorry shape… a good deal of its crust, the very backbone of any pie, literally what holds it together, was stuck to the inside of the woefully inadequate cardboard box. It was a sad sight for any graham cracker crust connoisseur. Ok, this one wasn’t the result of misleading packaging or stupidity on the part of the packaging team… just me. I’d just like to alert you to the fact that even if the box of angel food cake doesn’t specifically say “leave several inches of clearance above your Bundt cake pan,” you should do so anyway. I only wish I’d had another hand so that when I slid the top, cake-consumed rack out of the oven, I could have photographed the suspended cake in the few seconds it hung from said rack. 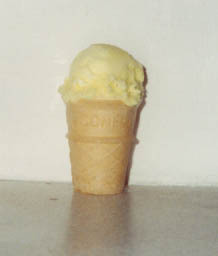 If you see a box of ice cream cones and think, “Wow, what a great treat that would be after a hot day in the Maine summer sun!” you should probably check the number of cones packed into that small box. Because when they say “Kid Size,” they’re not kidding… like Cabbage Patch Kid size. 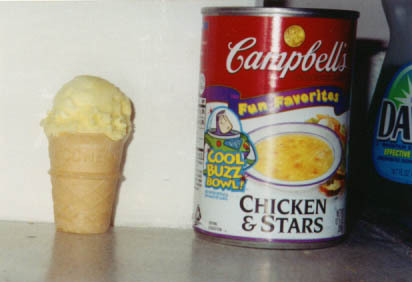 You basically need a melon baller to use as a scoop. 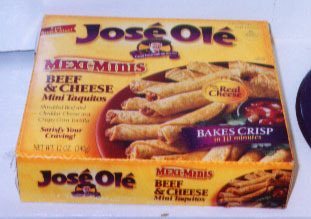 Mmmm, tasty Jose Ole Mexi-minis. 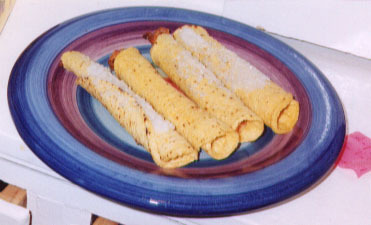 Beef & Cheese Mini Taquitos should make a delectable snack! AGAIN with the packaging department! Come on. How hard can it be to wrap my crispy little beef ‘n’ cheese delights in a bit of cellophane?